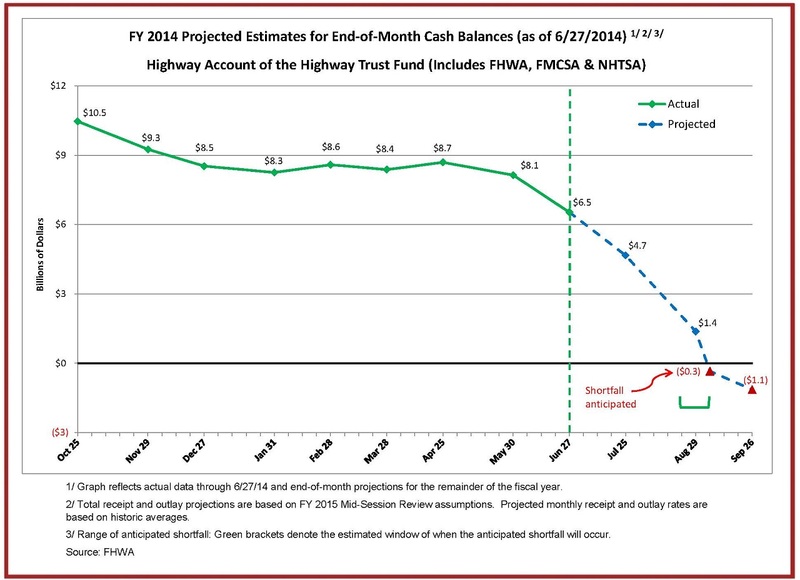 Remember our blog last August addressing the urgent need for Congress to reach a consensus on long-term funding for the Highway Trust Fund? In the few remaining moments prior to their recess last summer, Congress passed a $10.8 billion fix to keep the HTF alive through May 2015, but now the May 31st deadline is fast approaching, and history repeats itself as insolvency looms again. The need for Congress to find a long-term fix for the HTF is no less imperative almost a year later, and in fact the funding solution will need to cover greater damages the longer it is put off. Chart Courtesy of the United States Department of Transportation. As early as March, concerns arose from Congress regarding delayed state level projects at the beginning of the spring construction season. “States have already notified the federal government that they will be delaying or postponing or canceling projects” U.S. Representative Peter DiFazio (D-Oregon) reported, “I expect the number of canceled or delayed projects will only grow over the coming weeks if we don’t have a short term bill” (italics added). Congress continues to work in the short-term, running into funding deadlines. Whatever the short-term fix, this conversation will return. The resolution provides time for Congress to consider other sustainable funding mechanisms. Other funding proposals include using taxes collected by imposing levies on corporate profits stored overseas. As part of the resolution, the gas tax will automatically increase in three years if no agreement has been reached prior. Republican House Majority Leader Kevin McCarthy believes that passage of a long term bill is too much to undertake in the remaining legislative days in May, and stated that a short-term fix of about $8 billion to $10 billion is an essential step to a long term fix. As we all know, Michigan suffers from deteriorating roads and bridges, and turned last week to the voters to raise additional funds for our transportation system. That vote failed overwhelmingly, but the need for additional transportation dollars continues. Federal funds, down 8 percent in the last five years, account for nearly one third of Michigan’s transportation budget. Michigan ranked 7th lowest among states in per capita federal transportation funding in 2013, and 2nd lowest on overall per capita spending on roads, bridges, and highways. 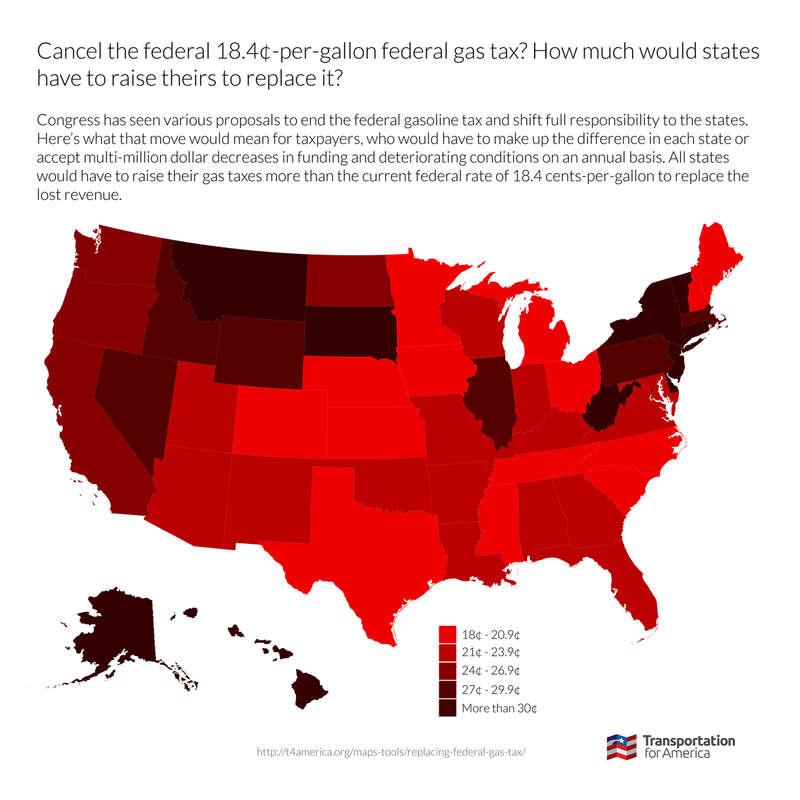 Transportation for America studied the effects on each state of eliminating the federal gas tax, and found all states would have to raise their per-gallon gas tax more than the federal 18.4 cents to replace lost revenue, and many states would need to raise their tax much more. Michigan would require a 20 cent increase, and would lose more than $91,000,000 if the 18.4 cent federal tax were converted to a state-level 18.4-cent tax, a per-capita loss of $9.22. As the deadline fast approaches you can get involved. Voices for Public Transit’s Rally to Rebuild America wants to share with Congress why Americans support a long term investment in the nation’s transportation infrastructure. To participate just print off the Rally to Rebuild America poster, use it to share why you support increased infrastructure funding by May 13th, and post your photo to the Facebook page. Continue to share with Congress by email, via local media, or encourage others to get involved right up until the deadline. Michigan’s transportation infrastructure continues to struggle with the limited financial resources available to us, and federal funding is one necessary piece to this puzzle.